Conflicts are an integral part of our lives. Conflicts stare at us in the face relentlessly, as we watch television, read the papers, or surf the internet and social media. When not addressed quickly, conflict evokes feelings of anger, embarrassment, injustice, disrespect, even the loss of dignity, among all affected parties. In many cases, conflict extends to litigation, which is reflected in the millions of cases clogging up our Judicial system. These conflicts-turned-litigation cases could be about two brothers fighting over their inheritance; two companies arguing over claims made in their advertising; or about a franchise being unhappy about the new terms of the agreement. I n almost all of these cases, emotions run high, and there is a total breakdown of communication, with both sides retreating to their respective corners, leaving their lawyers to fight it out in time-and-money consuming Courts of Law. Increasingly, Courts and conflicting parties are turning to alternate ways of settling disputes which have nothing to do with laying down the Law, or acts of criminality, but are of unresolved conflict between individuals or organisations. Interestingly, the function and framework of both – a good apology, and of a good mediation – are quite similar. Both aim to arrive on common ground and find a peaceful settlement, that is acceptable to all concerned. But conflicts, even corporate ones, don’t always require material or financial settlements. Where egos are bruised, or reputations affected, a heartfelt apology will often suffice. But arriving at an apology, isn’t easy. Which brings me to the concept of “a mediated apology” and the role it can play in resolving conflicts with intangible, subjective solutions. What is a Mediated Apology? To understand how a mediated apology would work, let us understand how Mediation works, and also what constitutes a genuine, meaningful Apology. 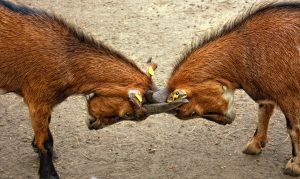 How does Mediation work to resolve conflicts amicably? What constitutes a meaningful Apology? Now here’s an example, of how Mediation helped resolve a highly-charged conflict between two employees of a company, with an Apology! One of the employees was a new, young supervisor, and the other was an older employee who had been with the organisation for three decades. They had worked very respectfully together, till one day the older employee successfully completed a project given to him by his senior, but by disregarding the younger man’s plans, and by replacing them with his own! The young supervisor wasn’t really bothered by his plans not being used, as long as the outcome was successful. But unfortunately, the next day, his unused plan and design was displayed on the notice-board of the office lunchroom, with derogatory remarks about his supervisory competence. The organisation management removed the offending notice, but similar comments reappeared the next day, and the next, six consecutive days! The supervisor was convinced that the older employee, perhaps jealous of this younger man’s position, was behind the negative campaign. He ended up confronting the older man, and a heated exchange took place, in which both of them ended up making very personal and ugly statements about each other. Following this, the young supervisor brought in a lawyer, and threatened to sue older man for defamation and harassment. At this point, the HR Manager of the organisation stepped in to avoid further escalation of the dispute, and arranged for Mediation between the two, where the Mediator made both aggrieved individuals hear each other out patiently, with an open mind, and no judgement. The older man immediately felt bad for the younger man, as he had had no part in maligning the younger man. He also regretted not having made his displeasure for the campaign known to his team. He was ready to apologise for the pain the younger man felt. On the other hand, the younger man acknowledged that he should not have had the heated exchange with the older man, based on misplaced assumptions. He was ready to cease hostilities, since the older man was ready to apologise, even though he had nothing to do with the smear campaign. 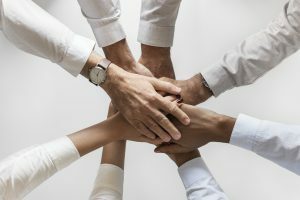 Against the initial advice of their respective lawyers, and protected by the confidentiality of the Mediation process, both employees decided to end the dispute with mutual apologies that were made in private. They also issued a joint statement, to put to end any talk of the dispute among others in the team and the organisation. Both the older man and his supervisor came out of the experience feeling better, having found common ground, and reiterating respect for each other. As you can see, this conflict, like many conflicts around us, was more about emotions and reputation, than it was about plans not being followed. The role of the Mediator here, was to help both parties recognise the pain caused to each other. Mediation helped bring out the underlying issues that needed to be addressed. And the apology helped in bringing out regret for what happened, with the hope of not repeating their respective mistakes. If we absorb and practice what these two great concepts teach us, we can resolve more and more conflicts with mindful mediation and/or apologies. We won’t just be able to resolve issues effectively, we will also be able to strengthen relationships between erstwhile conflicting parties. A seasoned communication leader with three decades of professional experience across Advertising, Public Relations and Corporate Communication, Radhika has held senior leadership positions in top global communication consultancies and created award-winning campaigns across multiple sectors. She has worked as a trusted advisor to CEOs, Governments, top lawyers, litigation experts and political leaders. A prolific public speaker, moderator and writer she has been a jury member for multiple international and national awards including the prestigious Cannes Festival of PR and Advertising. 2 Comments on "The Power of a Mediated Apology"
Much needed in today’s world plagued with strife. Mediation apology calls for embracing the other party’s ego into one’s larger one and together look at the larger picture. Explained in a simple manner and so easily doable. 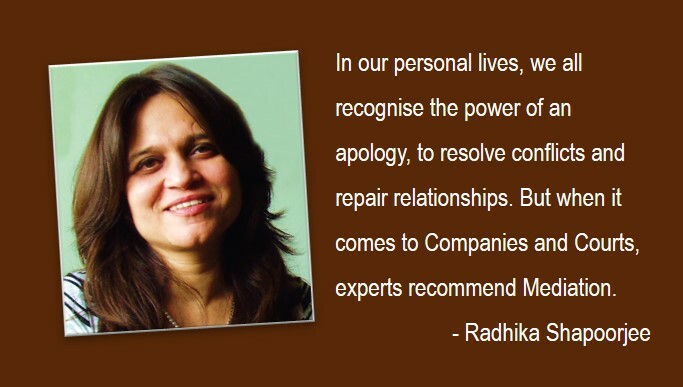 Well said, Radhika. Mediation is indeed the way to go for true truce. Apology is always tough as it means letting go off your ego, but the way you have explained Mediated apology is very refreshing. Thank you for this article.